Barbed wire is a type of fencing wire constructed with sharp edges or points arranged at intervals along the strand(s). It is used to construct inexpensive fences. A person or animal trying to pass through a barbed-wire fence will suffer discomfort and possibly injury. Barbed-wire fencing requires only fenceposts, wire and fixing devices such as staples. It is simple to construct and quick to erect by a skilled fencer. The most successful barbed wire was patented by Joseph F. Glidden of DeKalb, Illinois in 1874. It was an improvement on earlier less successful pointed wire products such as that invented in 1865 by Louis Jannin of France. 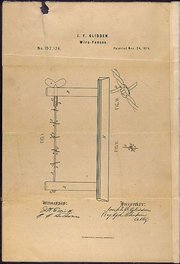 Patent Drawing for Joseph F. Glidden's Improvement to Barbed Wire, 11/24/1874. Barbed wire was the first wire technology capable of restraining cattle. Wire fences were cheaper to erect than their alternatives and when they became widely available in the late 19th century in the United States they made it affordable to fence much bigger areas than before. They made intensive animal husbandry practical on a much larger scale. In the American Southwest barbed-wire fencing led to disputes known as the range wars between free-range ranchers and farmers in the late 19th century. These were similar to the disputes which resulted from enclosure laws in England in the early 18th century. These disputes were decisively settled in favor of the farmers, and heavy penalities were instituted for cutting the wire in a barbed-wire fence. Barbed-wire fences remain the standard fencing technology for enclosing cattle in most regions of the US, but not all countries. The wire is aligned under tension between heavy, braced, fence posts (strainer posts) and then held at the correct height by being attached to wooden posts and battens, or steel star posts. The gaps between star posts vary depending on terrain—on short fences in hilly country they may be placed as closely as every 3 metres, whereas in flat terrain with long spans and relatively few stock they may be spaced out up to 30 to 50 metres. Wooden posts are normally spaced at 10 metres (2 rods) in any case with 4 or 5 batterns in between. Barbed wire for agricultural fencing is typically available in two varieties—"soft" or mild-steel wire and "high tensile". Both types are galvanised for long life. High-tensile wire is made with thinner but higher-strength steel. Its greater strength make fences longer-lasting because cattle cannot stretch and loosen it. It copes with the expansions and contractions caused by heat and animal pressure by stretching and relaxing within wider elastic limits. It also supports longer spans, but because of its "springy" nature it is less easy, and somewhat dangerous, for inexperienced fencers. Soft wire is much easier to work but is less durable and only suitable for short spans. In high soil-fertility areas where dairy cattle are used in great numbers 5- or 7-wire fences are common as the main boundary and internal dividing fences. On sheep farms 7-wire fences are common with the second (from bottom) to fifth wire being plain wire. In New Zealand wire fences have to be easy to get through by dogs because they are the main means of controlling and driving animals on farms. Most barbed-wire fences, while sufficient to discourage cattle, are passable by humans who can simply climb over the fence—or through the fence by stretching the gaps between the wires using non-barbed sections of the wire as handholds. To prevent humans crossing, many prisons and other high-security installations construct fences with razor wire, a variant which instead of occasional barbs features near-continuous cutting surfaces sufficient to severely injure anyone who climbs on or over it. Barbed wire is also used in war. Much of the artillery bombardment on the Western Front in World War I was aimed at cutting the barbed wire that was a major feature of trench warfare. The wire was not designed to stop the passage of men, just to impede them long enough to kill them with machine guns. Unrestrained violence against barbed wire will always result in moderate to severe injuries to the skin and, depending on body area and barbed wire configuration, possibly to the underlying tissue. Humans manage to not injure themselves too much when dealing with barbed wire as long as they exert a high degree of caution. Restriction of movement, appropriate clothing, and slowing down when close to barbed wire seem to be the key in reducing the extent of injury. Injuries caused by barbed wire are typically seen in horses, bats or birds. Horses panic easily, and once they get caught in barbed wire, large patches of skin may be torn off, sometimes exposing the underlying bone. At best, such injuries may heal, but they may cause disability or death (particularly due to secondary infection). Birds or bats may not be able to perceive thin strands of barbed wire and suffer impalement or lacerating injuries. Grazing cattle with slow movements, that will back off at the first notion of pain — sheep, cows — may not suffer the severe injuries that would typically be seen in other animals. Barbed wire has been reported as a tool to torture people (http://bmj.bmjjournals.com/cgi/content/extract/324/7333/317). There are some indications as to the precise extent of injuries. Other reports include deaths as possible consequence of barbed wire abuse, and even though full details about further investigations are missing, one has to assume that deep lacerations caused by barbed wire may also cause severe bleeding.